Because they last forever and look really great anywhere you place them, people perceive them as expensive. Another reason why they think so is because artificial arrangements are placed with higher value due to their extensive array of benefits. Compared to regular organic flowers, the price points can be a little different. But when you compute your savings and consider the benefits of purchasing a bouquet of flowers you’ll never have to water, prim, or throw out, it all adds up to maximum savings and benefits all-in-one! You’ll get exactly what you paid for and more! People often assume that imitations of the real thing are tacky. Sure it sometimes applies to things like makeup, luxury items, furniture, cars, accessories, and other items that have been copied for selling at a cheaper price, but with artificial flowers, that statement doesn’t apply. Artificial arrangements are comparable to organic ones on price points, realism, and quality. These factors are often met with a wise choice of switching to artificial variants that exude the same, or sometimes even more, qualities that any organic arrangement can give. Remember that they’re priced differently than organic flowers not just because they never wither, but they’re so close to the original that any person would suspect otherwise. This misconception can be taken in 2 different ways: One, where the artificial arrangement was from and two, the materials they were made with. We’ll have to be completely honest and say that some artificial flower arrangements are cheaper because they’re made with low quality materials. With low quality materials comes low quality products. People often misjudge artificial arrangements by how they’re priced instead of how they perform. Some would think badly of elegant and life-like arrangements with a higher price point and would similarly look at low cost variants of low quality. 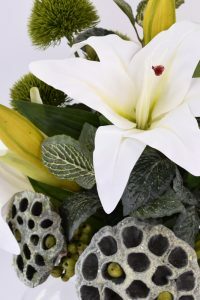 But what most people should know is that they’re paying slightly higher for branded artificial arrangements not because of their ability to brighten any room, but for their ability to stay beautifully fresh forever without looking a day old from the shops. Some people assume artificial arrangements don’t vary in sizes, shapes, colours, and flowers because they’re made to cater a different kind of market. What they don’t know is that the artificial flower industry is rapidly making changes happen that can put them in a higher ground unlike what they’ve been perceived of in the last couple of years. 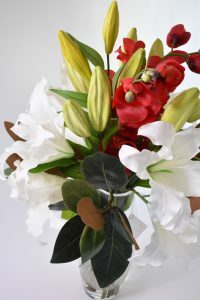 Companies have created and allowed people to have bouquets of fresh looking arrangements that do not grow in the same country, time of the year, or even in a specific size, colour, and shape. It’s even a trend today wherein brides and event organisers are incorporating these artificial flowers in bouquets, décor, and even in keepsake memorabilia. Can’t decide which one for the home or office – why not rent flowers for any given occasion? If you’re Melbourne based, we offer a rental service which means your bouquet vases will be forever changing! This alone makes an investment on real-touch artificial flowers a good one, instead of throwing them in the garbage when the real thing has passed it’s expiry.